Before I start with this review, I am going to just let you the readers know that I believe this is a film best seen with as little knowledge about it as possible. With that in mind I am going to keep this vague on the plot and hopefully I won’t spoil too much. 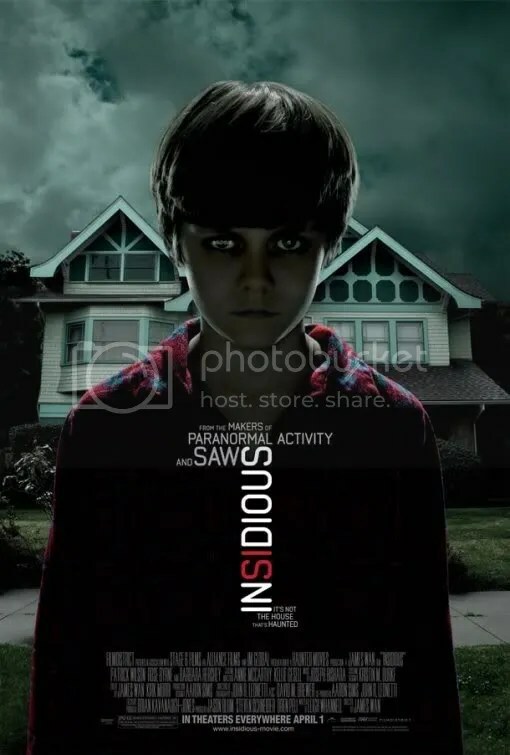 Insidious is a film from the men who brought us the original Saw (director James Wan and writer/actor Leigh Whannell), and unlike that film Insidious isn’t about physical torture, instead they’ve gone for a more supernatural approach. They had done something similar before with Dead Silence (my review here) yet Insidious takes a far more serious (and reality based) approach. The story centers on a family Josh and Renai Lambert (Patrick Wilson and Rose Byrne) and their three children who have just moved into a new house. Upon arriving into this new house, strange occurrences begin to happen and before long their son Dalton (Ty Simpkins) falls into a mysterious coma. In an effort to find out what is going on and to get their son back they enlist the help of a woman Elise (Lin Shaye) who is some thing of a paranormal expert. All is not what it seems, and twists and turns ensue. I was rather surprised by this film, I wasn’t really sure what to expect, the reviews had been mixed. Some were calling it an actual scary movie, others saying the third act derailed the film. It is hard to go into a film these days without other peoples opinions weighing on your mind. I tried to just put that aside and see for myself, and if this film lived up to the greatness I had seen with Saw. I am happy to report that I really liked this film, James Wan has certainly progressed as a director just as Leigh Whannell has as a writer and also an actor. There was a certain level of maturity (sorely missed in Dead Silence), and our central family was one I cared for, so when bad stuff started to happen it wasn’t very pleasant. This film is a perfect example that horror need not be all about killing and gore, instead it built atmosphere and it relayed on the audience’s imagination to create a fear factor. It did have jump scares, but it wasn’t something that was constant so when they did happen I actually did jump and get a fright. The film boasts some fantastic performances, with Patrick Wilson and Rose Byrne basically owning their roles. I bought them as a couple, and I bought their beliefs and reactions to the situation around them. It worked well and they both fed off of each other in such a natural way, the chemistry was there and it really needed to be in order for the couple to work. The children were actually really good, and Ty Simpkins was especially very strong. He made me notice his character and when the coma set in it was very upsetting. Barbara Hershey as mother to Josh didn’t have a huge role but for her limited screen time she made the most of it. Angus Sampson and Leigh Whannell as Elise’s helpers were there for a bit of comedy and explanation and they both did a good job. It was actually very odd to see Angus Sampson in a film like this, especially being so reserved. I really liked the both of them, they were two characters that could have easily failed but they didn’t. Lin Shaye as Elise was fantastic, she really did a marvelous job and I would say she stood out the most. As soon as her character got introduced she got my full attention and everything she had to say no matter out outrageous it might have been sounded believable. What a genius bit of casting, and I’d love to see her in more roles like this. She owned it. Overall I found Insidious to be a highly enjoyable yet frightening film, when the twists and explanations happened it all made perfect sense and I like that they went into a direction that was different. The film is very reminiscent of Poltergeist, and they do share similarities but the two films are also rather different. Insidious I think played it smart by having the colour played down, it almost looked sad. The sets looked amazing and they really worked so well, especially with building the atmosphere. The score was great, it was loud where it needed to be and low where it needed to be, it was done so well. James Wan has a particular style and the film felt like it was his, where as say unless you saw his name attached to Death Sentence, he probably wouldn’t have been a first guest as director. This is definitely a strength and it shows how much he put into the film. There isn’t much to fault with this film, if anything the pacing through certain sections felt a little off and some reveals felt a little rushed. I know there are people out there who probably wont or didn’t like this as much as I did but I vote for giving it a chance you might be surprised.